Bring Your Own Device (BYOD) is a policy that K12 schools (and businesses too) have adopted to allow students to bring their personal smartphones, tablets or PCs for use at school. This places an interesting challenge to the parent and the school administration. Who is responsible for CIPA compliance and safe Internet usage on these devices? Have the Cake. Eat it Too! Mobicip's new 'Network Whitelist' feature makes it possible to have it both ways. The school administration can be in-charge of internet safety at school and the parent elsewhere. 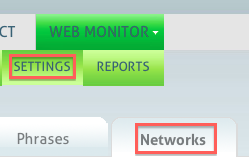 To enable the feature, login at mobicip.com and select Settings > Networks. Add the public IP address or address range to the list. The device will be filtered by the school's filter when used on the school network. Mobicip's cloud filter kicks in at all other times, allowing you tomanage internet filtering and monitor browsing activity. This step-by-step tutorial should help you get started. The feature is available to all Premium users as of today. Haven't upgraded yet? Simply login at mobicip.com and click 'Upgrade Now' when prompted. If you have any issues or concerns, please contact support. If you are happy with Mobicip, please leave a quick review in the Apple App Store or Google Play store. Your feedback and help is much appreciated!